Show Your Art. Share Your Ideas. First Year Portfolio Requirements You should submit a portfolio of 8-12 pieces of artwork in any media or style demonstrating a consistent or developing body of work completed within the past 1-2 years. You may include examples of artwork in any media that emphasizes your artistic strengths. Your ideas, concepts and technical ability should be clearly represented in your portfolio. It is suggested that all applicants submit some examples of direct observational drawings, and highly recommend if you are anticipating majoring in Art Education, Fine Arts, Fashion Design or Illustration. “Drawing from direct observation” specifically means drawing from what you see in real life, including people, objects and or spaces directly around you. Drawings that are copied from photographs, posters, or another person’s artwork are not considered to be observational drawings. 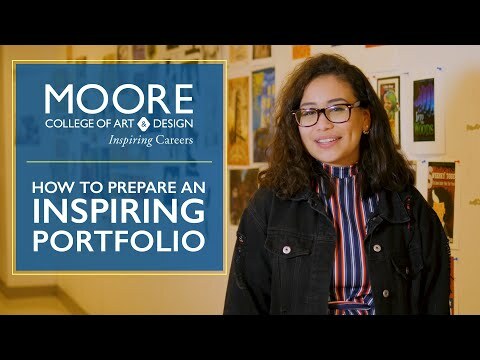 Your portfolio is a critical portion of your application to Moore College of Art & Design. You are highly encouraged to present your portfolio in person during your campus visit and meeting with your admissions counselor, so that you may have an opportunity to discuss your ideas and artistic motivation. Digital images may be submitted through Slideroom. Be sure to include an image inventory that lists title, medium and dimensions. You may also have your portfolio reviewed by an admissions counselor or faculty member during a National Portfolio Day event near you. Click here for portfolio review locations and dates. National Portfolio Days near you. You can get your portfolio reviewed by a Moore College of Art & Design representative at a National Portfolio Days.